The company originated in Hvitsten, a small town on Oslofjord in Norway, in 1848 by three Olsen brothers, Fredrik Christian, Petter and Andras, who bought their first ships and began an international shipping company. Life was never easy and Norwegian owners and sailors had a harder time than most, with conditions in the winter months can be very harsh and dangerous. By the time the first Fred Olsen died in 1875, 10 of the 22 vessels which he had owned had been wrecked whilst in his service. His brothers Petter and Andreas also went into the business, with small fleets of sailing vessels, starting in 1852 and 1860 respectively. It was Petter’s son, the Second Fred. Olsen, (Thomas Fredrik) who established the Olsen name as one of the most significant in Norwegian shipping. He was a practiced seaman who had assumed command of one of his father’s vessels at the age of 23. He was then given management of two of his father’s ships, and over the next few years, added others to his fleet. History information taken from The Fred. Olsen Line and its Passenger Ships, by Anthony Cooke. On the 19th May 1967 fanfare of trumpets sounded as the Mayor of Harwich, Councillor L.E. Hostler, cut a tape across the car deck of the luxury Norwegian cruise ship, Black Prince at Parkeston Quay, to mark the start of a new passenger and car service between Harwich, Kristiansand, and Amsterdam. with the Mayor was Councillor Mrs M.C. Wright, chairman of Tendring Rural District Council, who played a joint part in the ceremony. Built in 1966 by the Lübecker Flender-Werke Lübeck, West Germany for Fred. Olsen Lines for combined ferry/cruise ship operations. 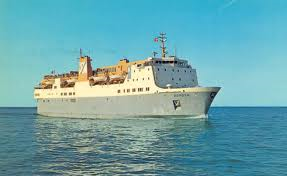 From 1970 until 1983 she sailed the northern hemisphere summer seasons on ferry service for Det Bergenske Dampskibs Selskab as Venus, while returning to cruise service with Fred. Olsen for the winter seasons. 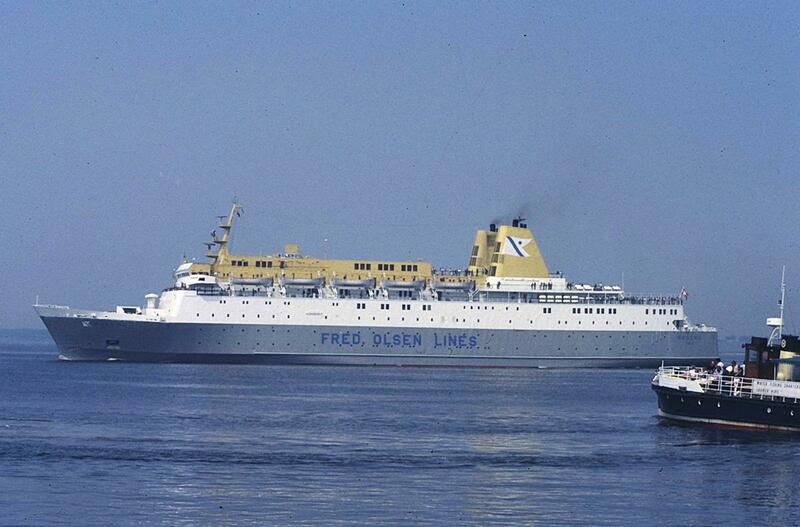 In 1983 the summer ferry service was taken over by DFDS, and in 1985 it passed to Norway Line. In 1986 Fred. Olsen bought the ship outright and she was converted to a full-time cruise ship, retaining the name Black Prince. The Black Prince was sold to Saveca for further cruise service in Venezuelan waters. Saveca plans to use the ship for cruises between islands within Venezuelan waters then as a floating hotel. Its last stop was in port of Santo Domingo. There was a rumour that a company was going to restore it so it could come back to service; nevertheless, it was scrapped in 2012. M.V. Black Watch was ordered jointly by Fred Olsen Line and Bergen Line to operate as the Bergen line Jupiter between Newcastle-Bergen during the summer, and as the cruise ship Black Watch between London and the Canaries in the winter. She was delivered from builders Lübecker Flender Werke in the spring of 1966, initially operating through the summer as Bergen Lines’ Jupiter. At the end of the summer, she transferred to the Fred Olsen service from London to Las Palmas and Tenerife as the Black Watch. In the early 1980s, DFDS was expanding its North Sea operations, and for the summers of 1982-84, they operated the Venus, and sister ship Jupiter, under charter on Bergen-Newcastle and Bergen-Amsterdam routes. However, in 1985, the Bergen-Newcastle service was operated by Bergen-based Norway Line, who chartered the Venus. In 1986, the joint ownership agreement between Fred Olsen and Bergen Line came to an end. Jupiter passed to Bergen Line and was soon sold to Norway Line. Black Prince became wholly owned by Fred Olsen, and was completely refitted as a full-time cruise ship, re-entering service in 1987. She operated as a one-ship cruise line until 1996, when Fred Olsen added the Black Watch. 29th May 1971 saw the arrival of M.V. Blenheim at Parkeston Quay; she was built in 1970 by Upper Clyde Ships builder Ltd, Clydebank. Between September and May she cruised to the Canary Islands, on a route London-Funchal-Santa Cruz de Tenerife-Las Palmas, whilst during the summer months May-September she ran ferry crossings from Kristiansand to Amsterdam or Harwich. 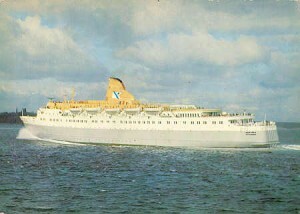 In 1981 Blenheim was sold to Scandinavian World Cruises, Nassau, Bahamas and renamed Scandinavian Sea. She operated short cruises to Freeport from Port Canaveral and Jacksonville. In 1984 she was burnt out and declared a constructive total loss. The remains for sold “as is” for further use. Registered ownership changed a number of times, and in 1985 she was renamed Venus Venture, whilst rebuilding occurred in Valencia. In 1986 she was sold to Discovery Cruises, and renamed Discovery I, returning to short cruises from Florida. She was eventually scrapped in India in 1997. M.V. Bolero was built in 1972 for Lion Ferry by Dubegion-Normandie S.A. Prairie au doc, Nantes.. She operated for Lion Ferry as Prince of Fundy II in the summers of 1973-76 between Portland, Maine, USA and Yarmouth, Nova Scotia. From 1976-78 she was chartered to Bergen Line on the route Bergen/Stavanger/Kristiansand-Newcastle. From 1978-78 she was chartered to Stena Line as Scandinavica. From 1981-91 operated as Bolero for Fred Olsen on North Sea services. 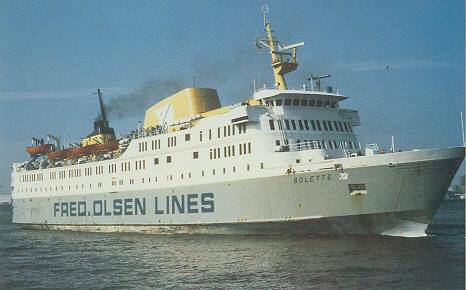 In 1991 Bolero passed to Color Line as the Jupiter, operating between Kristiansand-Hirtshals and Oslo-Hirtshals until 1994. 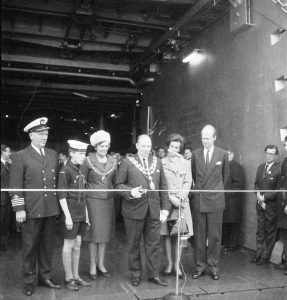 13/06/1972 Launched as Prince of Fundy II. 17/02/1973-23/02/1973 Prinzen Line. Bremerhaven — Harwich. Yard. Jos L Meyer Werft, Papenburg-Ems, Germany. M.V. Bolette was built as the Viking 5 and was delivered to Viking Line partner Sally in 1974, for the Stockholm-Helsinki route. 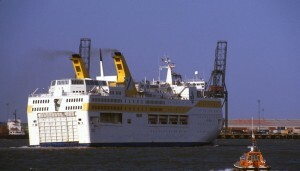 In 1984 she was sold to Fred Olsen, and served as the Bolette until 1988. Yard. Aalborg Værft A/S, Aalborg, Denmark. 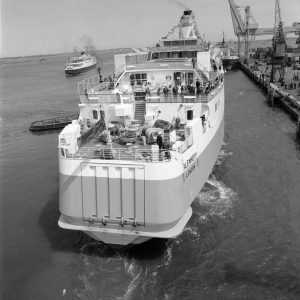 M.v Borgen arrived at Parkeston Quay in 1976 with a passenger certificate for 800; the overnight ferry was unsuitable for the 22 hours North Sea Crossing. The service only operated once a week on Wednesdays. Yard. Wärtsilä Turku Oy Ab, Finland. Fred Olsen’s new luxury ship M.V. 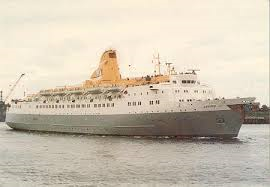 Braemar was introduced onto the Harwich/Norwegian route on the 1st June 1985, at 14,300 tons; she had a capacity for 2,000 passengers and 486 cars. Braemaer was typically Scandinavian; it had an amazing tropic garden lounge, a sauna bath, a swimming pool and its own jogging track. Braemar was built as the Viking Song by Wärtsila Marina Åbo, Finland, in 1980, for Rederi AB Sally, part of the Viking Line consortium. 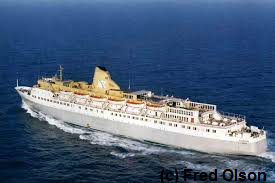 She was sold in 1985 to Fred Olsen, and served as Braemar on North Sea services. In 1991 she was chartered to the Baltic Shipping Company to start a service between Kiel and St Petersburg as Anna Karenina. This service was later marketed by Silja Line, but the service ceased in 1996. Anna Karenina was bought by a company jointly owned by Nordström & Thulin and Estline, for use by Estline as Regina Baltica. In 2000 the charter of Regina Baltica transferred to Tallink. 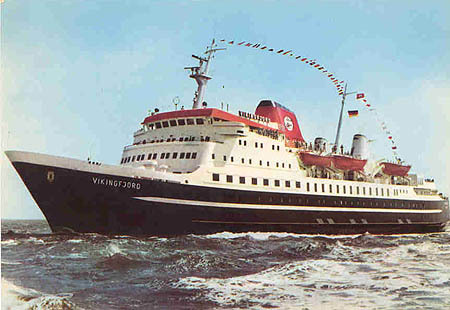 The 1970 Harwich-Norway service was to have been performed by a brand new ship, but late delivery from the builders forced Fred Olson to charter the Vikingfjord chartered from a German company and built in 1969, 4,500 tons the ship had accommodation for only 500 passengers, which meant some passengers had to be accommodated on flights. Vikingfjord was built in 1969 by Jos L.Meyer Vaerft, Papenburg. She entered service with Nordlandfähre (Hamburg) between Cuxhaven-Skudneshavn (Stavanger)-Bergen in August 1969. 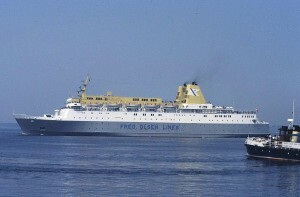 The route closed the following year, and Vikingfjord operated brief charters for Fred Olsen (Kristiansand to Amsterdam or Harwich) and Moltzau Line (Gedser to Travemünde). Late in 1970 she was chartered to Hadag (Hamburg), then part owners of Prinz Ferries. Vikingfjord was renamed Prinz Hamlet II for service between Hamburg and Harwich.